Mohammad Fazlollah Zahedi (1896 - 1963) was an Iranian general, Prime Minister, and politician. Having risen to the rank of brigadier-general after distinguishing himself by crushing a Kurdish rebellion in the west of Iran, he became head of the national police service in 1931. He was arrested by the British during World War II, accused of profiteering and of pro-Nazi sympathies. After the war, he was re-instated as chief of police until appointed to the Senate in 1950. By 1951, he was interior minister in the government of Mohammed Mosaddeq but was dismissed later that year for ordering police to open-fire on rioters protesting the visit by Averell W. Harriman, the United States Commerce Secretary who had been asked to mediate in the oil dispute between Britain and Iran. In 1953, Zahedi was chosen by the U.S., the British, and the Shah as their candidate for Prime Minister following the coup that overthrew Mossadeq on the grounds that he was allegedly pro-communist. Zahedi was himself dismissed in April 1955 as the Shah decided he was becoming too powerful. He ended his career as Iran's ambassador to the United Nations at Geneva. Effectively, the 1953 coup restored tyrannical, oppressive power to the Shah, Mohammad Reza Pahlavi. Zahedi cannot wholly be blamed for allowing the British and Americans to use him in overthrowing a democratically elected government to support a pro-Western ally in their Cold War opposition to communism. However, he can be blamed for his willingness to take part in this coup; indeed, he may have instigated this himself. He appears to have spent his life taking whatever opportunities he could to further his own interests with little real concern for whether this furthered the welfare of the people he purportedly served. He may not have predicted the long-term impact that the coup would have on U.S.-Iranian relations; the popular slogan "death to America" expresses the degree to which Iranians blame the U.S. for supporting the Shah's oppressive regime. With other examples of Britain and the U.S. supporting non-democratic, oppressive regimes, the legacy of the coup that brought Zahedi to power makes the task of spreading freedom around the world harder to achieve, since the real intent of intervention by the Western powers, when this occurs, is dismissed as self-interest, with no genuine concern for the people of the country concerned. Born in Hamedan in 1896, Fazlollah Zahedi was the son of Abol Hassan "Bassir Diwan" Zahedi, a wealthy land owner at the city of Hamedan. During his service at the Imperial Russian-trained Iranian Cossack Brigade, one of his comrades in arms (his superior in fact) was Reza Khan, later Reza Shah Pahlavi. He was among the officers dispatched to Gilan who put an end to the Jangal movement of Gilan of Mirza Kuchak Khan. At the age of 23, as a company commander, Zahedi had led troops into battle against rebel tribesmen in the northern provinces. Two year later Reza Shah promoted him to the rank of brigadier general. The alliance, forged between the two men, was to endure a lifetime and continued to bind their sons, personally as well as politically. He was also involved in the overthrow of Seyyed Zia'eddin Tabatabaee's government in 1920. It was Colonel Zahedi who arrested Sheikh Khaz'al Khan and brought him to Tehran. 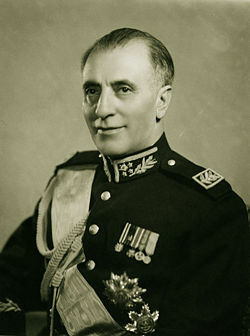 During Reza Shah's reign, General Zahedi was named (1926) military governor of Khuzestan province, holding the hub of Iran's oil industry, and in 1932 chief of national police, one of the nation's top internal posts. The Shah was impressed by his "loyalty and firm hand." During World War II he was appointed (1941) commanding general of the Isfahan Division. Following the forced abdication of Reza Shah (1941), Zahedi was arrested by British forces in 1942 allegedly for his sympathy for Nazi Germany, and hoarding of grain with which he was "making huge sums" on the black market. Kinzer says that he had planned to coordinate a "tribal uprising to coincide with a possible German thrust into Iran." He was flown out of the country and interned in Palestine until the end of the war. Returned from internment in Palestine in 1945, during the reign of Mohammad Reza Shah (Reza Shah's son and successor), General Zahedi became Inspector of military forces in southern Iran. He became once more chief of national police (Shahrbani) in 1949, when Mohammad Reza Shah appointed him as chief of the Shahrbani Police Forces, in order to counter the growing threat of Sepahbod Haj Ali Razmara. General Zahedi (l) and Mohammad Reza Shah, April 1955. After retiring from the army, he was named Senator in 1950. Zahedi was appointed Minister of the Interior (1951) in Hossein Ala''s administration, a post he would retain when Dr. Mohammad Mossadeq became Prime Minister at the Shah's request. Zahedi actively supported the new government's nationalization of the oil industry, which had previously been owned by the Anglo-Iranian Oil Company, now BP. However, he was at odds with Mossadeq over his increasing tolerance for the outlawed communist party Tudeh, which had boldly demonstrated in favor of nationalization. Both of these moves naturally antagonized the Western Powers, especially the United Kingdom and the United States. Mossadeq dismissed Zahedi in mid-1951 for "ordering the massacre of rioters who were protesting" the visit by Averell W. Harriman. Mosadeq accused him of fostering plans for a coup in October 1952, arresting him in late February 1953. Meanwhile, sanctions levied by the Western Powers significantly curtailed Iranian oil exports, leading to an economic crisis. Disorder among several ethnic groups in southern Iran and labor unrest among oil-field workers put further pressures on the government. The United States under President Dwight D. Eisenhower, citing Mossadegh's allegedly pro-Moscow inclination, came to view constitutional government as a strategic threat. 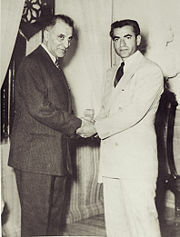 At the behest of the British and American government, and assured of their support, the Shah demanded Mossadegh's resignation in February 1953. Mossadegh refused, bringing to head a crisis that would end the era of constitutional monarchy and would replace it by direct rule of the Shah. The newly-formed CIA, along with the British spy agency MI6, took an active role in the developments, terming their involvement Operation Ajax. Zahedi and his followers, financed and armed by the foreign intelligence services, organized supporters of the Shah onto the streets, calling for the Prime Minister's ousting. There were such riots in Tehran and other cities. Zahedi is said to have received "$100,000" in funds from the CIA. Zahedi had been released in what Keddie described as a "conciliatory gesture." Fearing his arrest, Zahedi went into hiding. Mossadegh responded by breaking diplomatic relations with Britain and closing the British Embassy, which denied "MI6 a base from to operate." The British had chosen Zahedi to replace Mossadeq because both they and him were willing to "forget the past" attracted by his "boldness and well known ruthlessness." Although no longer "in the army" Zahedi was President of the Retired Officers Association, which provided him with a strong constituency.Kinzer describes his choice as not ideal, citing a New York Times article that described him as a "boulevardier with a penchant for gambling and beautiful women" but says that he was "better than anyone else available." He shared "the Shah's view of what Iran needed." Hiro suggests that it was Zahedi who contacted the British to support his planned coup. In August 1953, Mossadeq attempted to convince the Shah to leave the country. The Shah refused, and formally dismissed the Prime Minister, in accordance with the Constitution. Mossadeq refused to resign, however, and when it became apparent that he was going to fight, the Shah, as a precautionary measure foreseen by the British/American plan, on 15th August fled first to Baghdad and then to Rome, Italy, after signing two decrees, one dismissing Mossadeq and the other naming Zahedi to replace him as Prime Minister. Mossadeq again refused to step down. Supported by the United Kingdom and the United States, and encouraged by the intelligence agents Kermit Roosevelt and Donald N. Wilber, Zahedi staged a counter coup on the August 19 1953, drawing supporters from the military as well as the public. Relying for his legitimacy on the Shah's decrees, Zahedi sent out thousands of copies, along with the proclamation of himself as Prime Minister. The Shah returned triumphantly from exile on August 22, 1953. Many contemporary sources attribute the coup, or counter coup, entirely to the U.S. American CIA (CIA Coup) and agents of the British MI6 who are reported to have organized and paid for it. These sources point to many other coups in which the CIA was instrumental, such as those in Congo (1964), Chile (1973), and Algeria (1991). Monarchists, however, argue that the counter-coup was in fact a popular uprising, and that the foreign intelligence agencies' undeniable involvement was peripheral. At least some historians argue the coup could not have taken place without both CIA organizing and Iranian support. Having acquired an unprecedented power-base and, as a consequence, evoking increasing unease at home, the Premiership of General Zahedi ended in 1955 when the Shah dismissed him as a threat to his own power. He was more or less sent into his exile as Ambassador to the United Nations in Geneva. He died in Geneva in September 2, 1963. Zahedi descends from the Sufi mystics Sheikh Zahed Gilani (1216-1301) and Sheikh Safi Al-Din Ardebili, the eponym of the Safavid Dynasty. Through his mother, Djavaher Khanom, he traced his descent to the dynastic ruler Karim Khan Zand. Zahedi married Khadijeh Pirnia, daughter of Mirza Hussein Khan Pirnia (titled Motamen-ol-Molk), and granddaughter to Mozzafar-al-Din Shah Qajar (1853-1907). They had a son, Ardeshir, and a daughter, Homa. Ardeshir, a later politician and diplomat, married Princess Shahnaz Pahlavi, daughter of Mohammad Reza Pahlavi from his first marriage to Princess Fawzia of Egypt, daughter to King Fuad I. Homa Zahedi was a member of Parliament. Zahedi's role in the 1953 coup contributed to the embittering of U.S.-Iranian relations. The Shah's regime was oppressive and many of his policies alienated Iran's Muslim leaders, who eventually led the Iranian people in the Islamic Revolution of 1979, during which the cry "death to America" was a popular slogan. The people of Iran blame the United States, and to a lesser degree Great Britain, for propping up the Shah's tyrannical rule. Zahedi was a man who seized whatever opportunities he could to achieve his personal goals for wealth and power. The U.S. had itself viewed him as "unscrupulous" and as an "opportunist," as had the British, until they decided that he could be used to advance their own purposes. Zahedi cannot wholly be blamed for allowing the British and Americans to use him in overthrowing a democratically elected government to support a pro-Western ally in their Cold War opposition to communism. However, he can be blamed for his willingness to take part in this coup; indeed, he may have instigated this himself. He may not have predicted the long-term impact that this would have on U.S.-Iranian relations. With other examples of Britain and the U.S. supporting non-democratic, oppressive regimes, the legacy of the coup that brought Zahedi to power makes the task of spreading freedom around the world harder to achieve, since the real intent of intervention by the Western powers, when this occurs, is dismissed as self-interest, with no genuine concern for the people of the country concerned. Zahedi did not live for the sake of others but to further his own financial and personal interests. ↑ 1.0 1.1 1.2 1.3 1.4 Kinzer (2008), 142. ↑ 2.0 2.1 Kinzer (2008), 144. ↑ 3.0 3.1 Keddie and Richard (2003), 128. ↑ Kinzer (2008), 5, 6, 210. ↑ Keddie and Richard (2003), 140. Gasiorowski, Mark J. 1991. U.S. Foreign Policy and the Shah: Building a Client State in Iran. Ithaca, NY: Cornell University Press. ISBN 9780801424120. Hiro, Dilip. 1987. Iran Under the Ayatollahs. London, UK: Routledge & Kegan Paul. ISBN 9780710211231. Keddie, Nikki R., and Yann Richard. 2003. Modern Iran: Roots and Results of Revolution. New Haven, CT: Yale University Press. ISBN 9780300098563. Kinzer, Stephen. 2007. Overthrow: America's Century of Regime Change from Hawaii to Iraq. New York, NY: Times Books/Henry Holt. ISBN 9780805082401. Kinzer, Stephen. 2008. All the Shah's Men: An American Coup and the Roots of Middle East Terror. Hoboken, NJ: John Wiley & Sons. ISBN 9780470185490. Lentz, Harris M. 1994. Heads of States and Governments: A Worldwide Encyclopedia of Over 2,300 leaders, 1945 Through 1992. Jefferson, NC: McFarland. ISBN 9780899509266. Pahlavi, Mohammad Reza. 1980. Answer to History. New York, NY: Stein and Day. ISBN 9780812827552. Pollack, Kenneth M. 2005. The Persian Puzzle: The Conflict Between Iran and America. New York, NY: Random House. ISBN 9780812973365. Powers, Thomas. 2004. Intelligence Wars: American Secret History From Hitler to al-Qaeda. New York, NY: New York Review Books. ISBN 9781590170984. Secrets of History: The C.I.A. in Iran—A special report. ; How a Plot Convulsed Iran in '53 (and in '79). The New York Times, April 16, 2000. New york Times article of 20th August 1953. This page was last modified on 4 April 2017, at 20:30.